One of the most exciting moments in wild bird photography for me is witnessing for the first time the spectacular beauty of a rarely photographed Philippine endemic in the wild. This individual was among a flock of three birds that were foraging among the treetops at Quezon National Park way back in 2005. 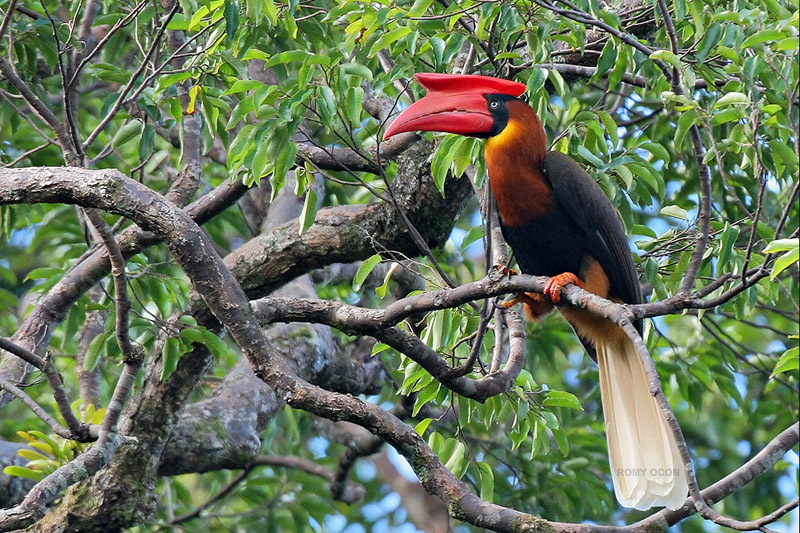 With a total length of almost a meter, this bird is the largest Philippine hornbill. It is found in forest and edge, and in recent times has become less common on account of its fast shrinking habitat and its “single nestling” breeding habit. Apart from its huge size, the feature that grabbed my attention even from afar was its striking casque (horny outgrowth on the head) - it is huge, with a color similar to cooked crab claws. This part of the head/bill must play a major role in the bird's very loud (and scary) kaaaaw call. The Sigmonster at full zoom (800 mm) was still not long enough to fill the frame at a shooting distance of circa 80-100 meters. I had to crop aggressively to strengthen the composition of the shot. Shooting Info - Quezon National Park, Quezon Province, Philippines, November 5, 2005, Canon 350D + Sigmonster (Sigma 300-800 DG), 800 mm, f/8, ISO 400, 1/160 sec, 475B/3421 support, jpeg capture in available light, major crop. Awesome Romy! The color and texture of the casque reminds me of a flower I've seen in Hawaii. Sorry, I don't know the name. Maybe it grows in the Philippines also? The similarity is striking.